How to Easily Master Format SAMSUNG Z2 (TIZEN) with Safety Hard Reset? Tips and solutions to solve problems at SAMSUNG Z2. Samsung continue to develop their own operating system which have name Tizen OS, SAMSUNG Z2 use Tizen operating system with 4 LCD screen size, this phone is cheap but it can run many interesting applications for daily activity. This www.hard-reset.org community will try to give important review and solutions to fix trouble at SAMSUNG Z2. What is Advantage of SAMSUNG Z2 (TIZEN) Specifications? If we see the menu at LCD screen, choose Phone initialization (Factory reset except SD card) with Volume Button to select and use Power Button to ok or enter. Continue to choose Yes at Tizen system recovery menu. The SAMSUNG Z2 (TIZEN) will doing the process of restoring to factory default. How to Install and Uninstall Applications at SAMSUNG Z2 (TIZEN) ? By default, SAMSUNG Z2 already have their own applications store library which known as Tizen Store. Open this applications from SAMSUNG Z2 (TIZEN) then find apps or browse the related category, then choose GET for free apps or choose BUY for purchase applications. To uninstall applications from SAMSUNG Z2 (TIZEN), please go to menu Setting > Apps > App manager, then choose Uninstall. It will remove applications together with setting files, but some history or logs folders may still at our memory depend on applications. How to Make Battery of SAMSUNG Z2 (TIZEN) Stronger, Life Longer and Not Fast to Drain ? The battery size of SAMSUNG Z2 (TIZEN) is only 1500 mAh capacity, but this size is worth to use at 4 inches LCD screen size, more over Samsung said that Tizen will have good battery management to make it work more longer. However, we also can do some adjustment to make SAMSUNG Z2 (TIZEN) not fast to drain. First try to reduce LCD brightness as low as possible to have battery prolong life before empty. [Q] my phone does not reboot it keep on saying USB INIT START! USB CORE RESET DONE DOWNLOADING this take even three days not changing what must i do? [A] Hi, please try to do hard reset using hardware button combination key like steps at #Option 2 above to reformat your Samsung Z2 Tizen operating system to factory default. [Q] I was updating the system software and the Samsung z2 went off. So help me fixe the problem. [A] Hi, it seems that your Samsung Z2 operating system crash. We suggest to do hard reset using hardware button combination key to reformat your Samsung Z2 Tizen to factory default. The information from this page describe about how to reset samsung Z2,Samsung z2 hard reset,how to flash samsung z2,samsung z2 reset code,samsung tizen restart,samsung z2 mobile all restart codes,samsung z2 initializing how can i fix and repair,samsung z2 hard reset key,restore data sumsung z2 settings,samsung izen z2 recovery. If you need another resource for hard reset, use search function at this homepage or find from our related posts. How to Easily Master Format LENOVO K3 / K30-T / LIME with Safety Hard Reset? Hi, maybe you should try to download other pictures viewers from Tizen applications store and see what happen with that. Otherwise, please try to consider do backup all data and do hard reset to reformat your Tizen Z2 operating system restore back to factory default. I was updating the system software and the Samsung z2 went off. So help me fixe the problem. Hi, it seems that your Samsung Z2 operating system crash. 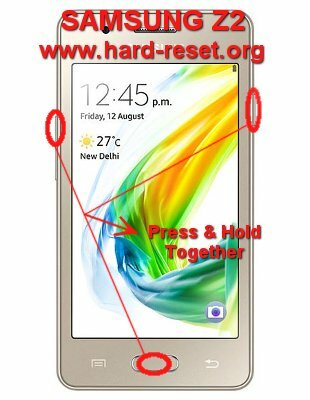 We suggest to do hard reset using hardware button combination key to reformat your Samsung Z2 Tizen to factory default. this take even three days not changing what must i do? Hi, please try to do hard reset using hardware button combination key like steps at #Option 2 above to reformat your Samsung Z2 Tizen operating system to factory default.